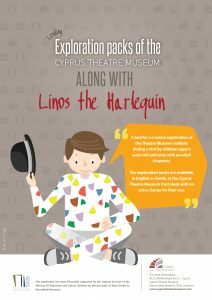 The Cyprus Theatre Museum offers exploration packs for children (5 years old and over) who are accompanied by an adult, for an autonomous visit to the Μuseum and the exploration of selected exhibits. The lending exploration packs «Along with Linos the Harlequin» contain specially designed booklet with a colourful design and activities as well as a user-friendly map. The material guides the users through a tour that lasts approximately one hour in which the children have the opportunity to have an interesting and pleasant visit, playing and discussing between them and with the adults accompanying them. Interested visitors can borrow the exploration pack «Along with Linos the Harlequin» from the office of theΜuseum by depositing an ID Card with no extra charge for their use. The pack is also available in English. The creation of the exploration packs «Along with Linos the Harlequin» was financially supported by the Cultural Services of the Ministry Of Education and Culture, under the Scheme for the provision of State Grants to Accredited Museums.